Having an online business can be such a strange career. And by strange, I mean lonely. Most days I don’t talk to any co-workers. I do most of my work in my own home so there’s no real reason to go see other people. But there’s something about being a blogger that is just so damn cool. Because other bloggers are the only people in the world who actually get it. They get the passion toward creating something of your own that you can be proud of. They get wanting to run the show and make all the rules and being able to call yourself boss. And most importantly, they totally get the lonely. They understand that often the only people we talk to all day long are our kids, and well, that can drive anyone batty. And that is why there are so many support groups on Facebook for bloggers of all types. I truly don’t know what I would do without these groups and all of the friends I have made through these groups. The funny thing is, I have hundreds and hundreds of friends who I would consider my co-workers and some of my absolute favorite people in the entire world… yet we’ve never met face-to-face. It’s just a crazy bond that we have because of this online business we’ve all created for ourselves. And I have so much pride for my amazing friends who are all major rockstars. Seriously. They are cranking out some of the most gorgeous cookbooks ever, and I’m doing my best to get my hands on each and every one. Thankfully, my sweet friend Mary of the site, Barefeet In The Kitchen, has graciously given me a copy of her beautiful book full of easy and delicious recipes. Seriously, I have about 30 recipes earmarked and can’t wait to try them all. 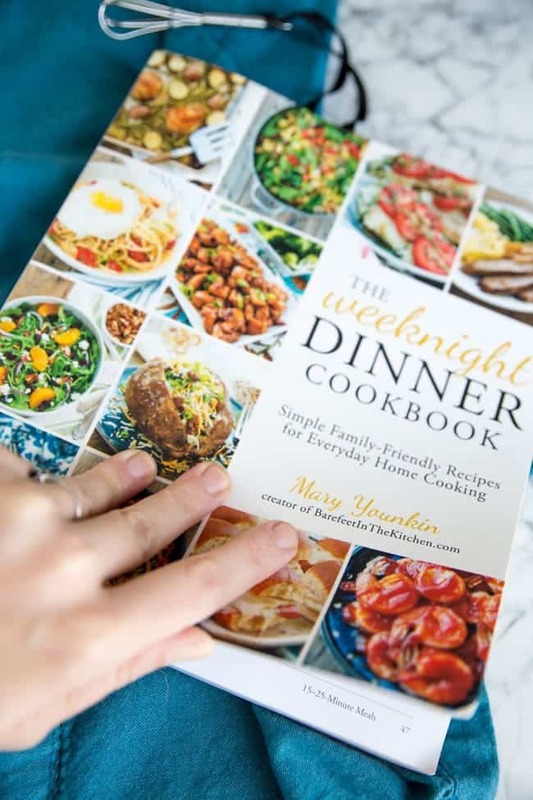 Mary’s cookbook is called The Weeknight Dinner Cookbook, and it’s absolutely perfect for busy moms that just want to be able to feed their families delicious food without it being a big hassle. 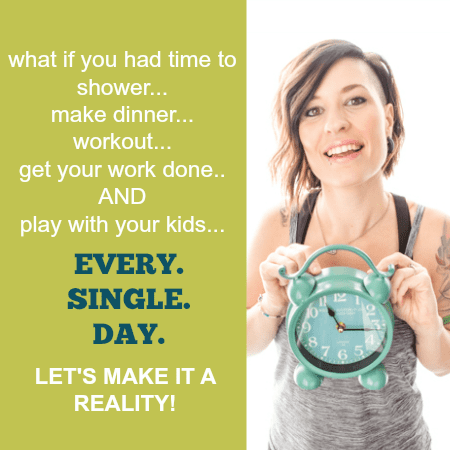 You have got to get your hands on a copy if you struggle with coming up with meals and especially ones that are quick enough for busy weeknights. But the first one I saw as I opened the cover was these nachos. 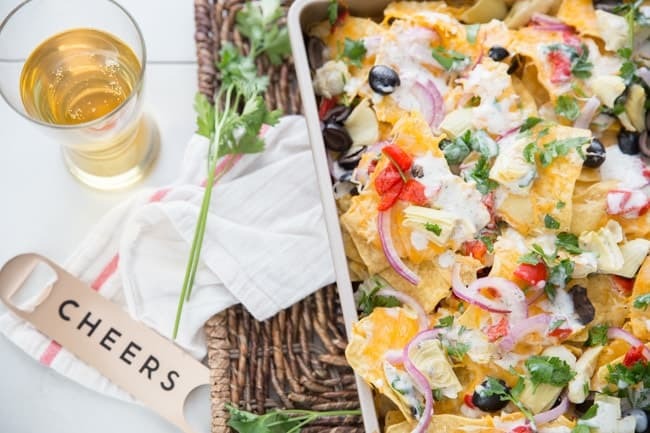 Nachos are my weakness, so there’s no surprise that they caught my eye right off the bat. 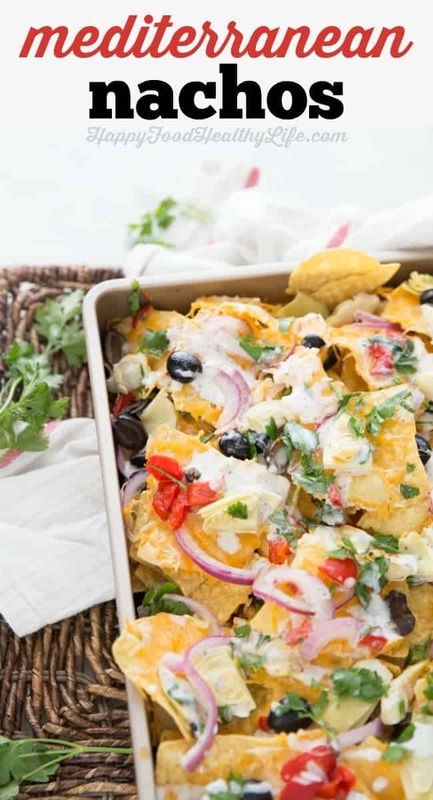 The thing is, these aren’t just any nachos. 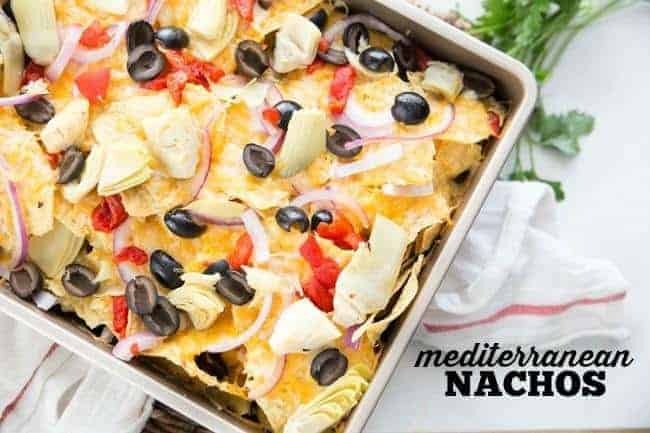 Mary put a fun spin on your classic southwestern-flavored nachos, and went Mediterranean with it. Artichokes. Olives. Red Peppers. Onions. Oh, and of course cheese. Lots and lots of cheese! And I couldn’t help but drizzle a whole bunch of tzatziki sauce all over the top just to tie it all together. Here – let me show you just how easy these are to make. If you liked the video, please please please do me a huge (but easy) favor. Click on over to YouTube and subscribe to my channel so you can get all the updates for my fun videos that I create just for you. AND if you really liked it, feel free to give it a little thumbs up and/or a comment while you’re over there. Thanks, you rock! Seriously. I’m thinking about game day. I’m thinking about movie night. I’m especially thinking about a weeknight that I have no desire to make a real dinner but still want everyone to get food in their bellies. 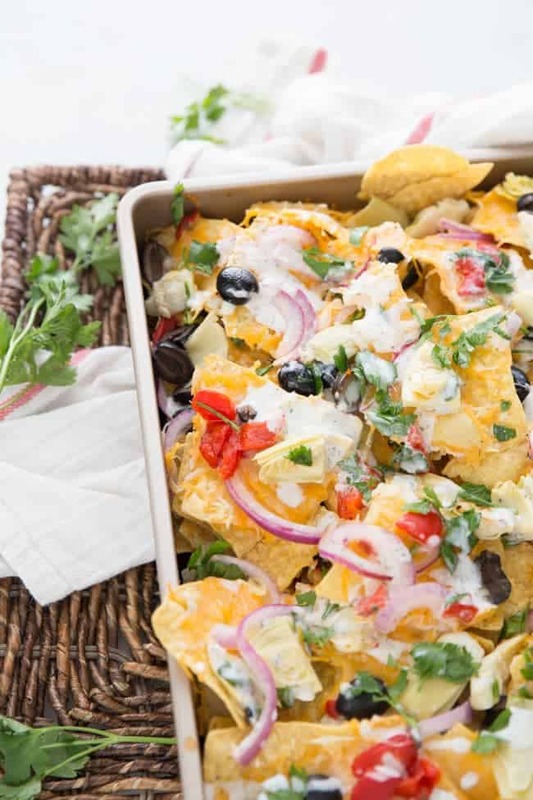 Make these nachos, and then be sure to grab a copy of the cookbook for many more delicious recipes (and even desserts)! 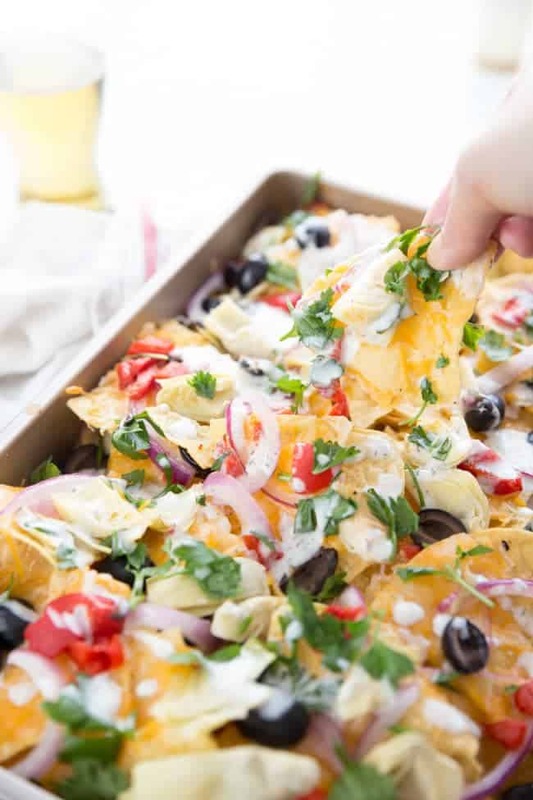 Spread about half of the chips across a large rimmed baking sheet or a 9x13 baking pan. Combine both cheeses in a bowl. 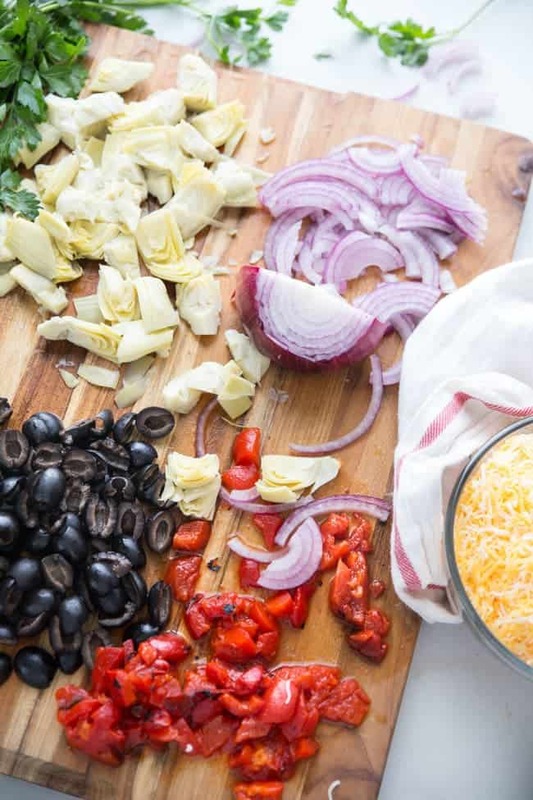 Sprinkle about half the mixture over the chops and top with half the olives, half the artichoke hearts, half the onion, and half the red peppers. 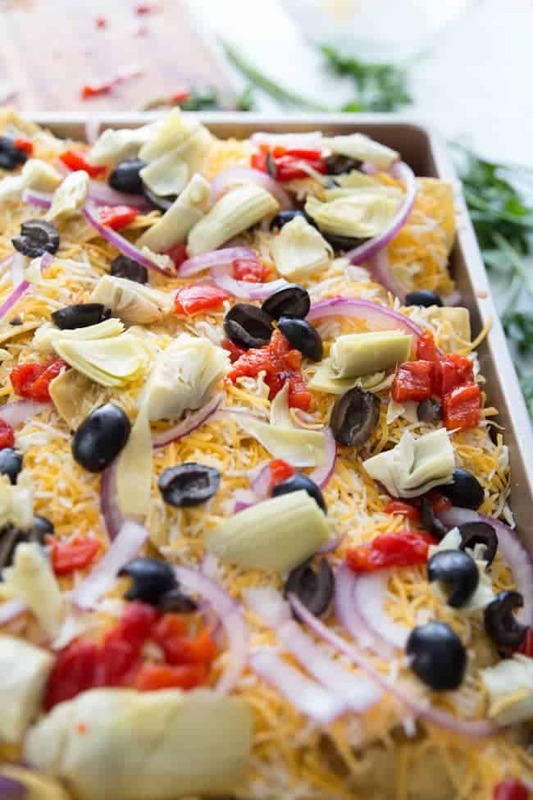 Spread the remaining chips, cheese, and other toppings over the top. Bake for 7-10 minutes, until the cheese has melted completely. Remove from the oven and sprinkle with the parsley and drizzle with tzatziki sauce. If you like this recipe, make sure you share it with your friends, using the Pinterest, Yummly, Twitter, Facebook, and StumbleUpon buttons below. I love this, Holly!! I’m thrilled that you’re enjoying the cookbook. Your video is amazing and now I’m craving those nachos like mad. Thanks so much! Blogger life is a beautiful, tricky thing, isn’t it? 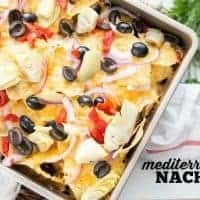 I love the Mediterranean twist on these nachos! Delicious! Thanks Melissa! It sure is tricky, but I wouldn’t trade it for any other job. I just love it, despite its challenges.